Kuala Lumpur is said to derive its name from the muddy confluence of two rivers—The Gombak and The Klang—merging, the swirling waters were originally muddied by the explosion of tin mining upstream during the early 1800s that drew many Sumatran and Chinese migrants to the region and helped lay the foundations for Malaysia’s present-day cosmopolitan capital city. This year Malaysia celebrated its independence on Friday, August 31st and Vietnam celebrated its independence on Monday, September 2nd. So, if you happened to work between KL and HCMC you could enjoy a four-day long weekend. Utilizing the holiday, we flew down to KL on the Friday for our annual company staff trip. 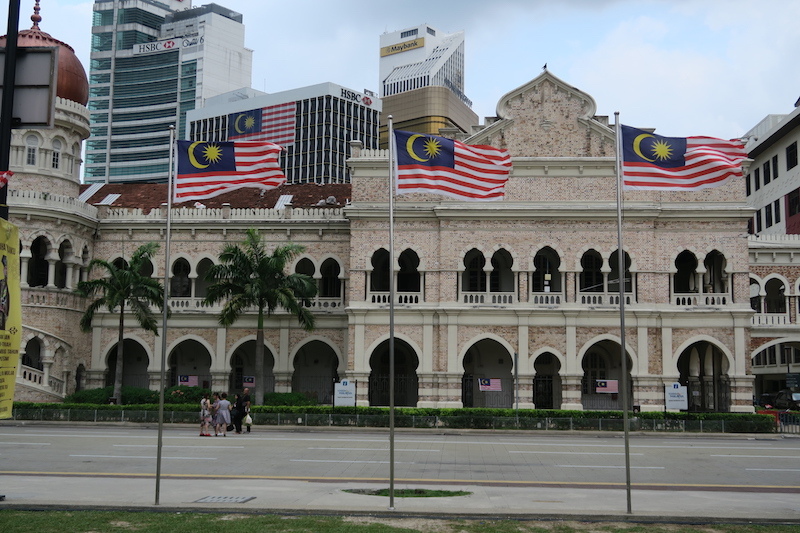 We found the city’s buildings adorned in Malaysian national flags for the holiday. 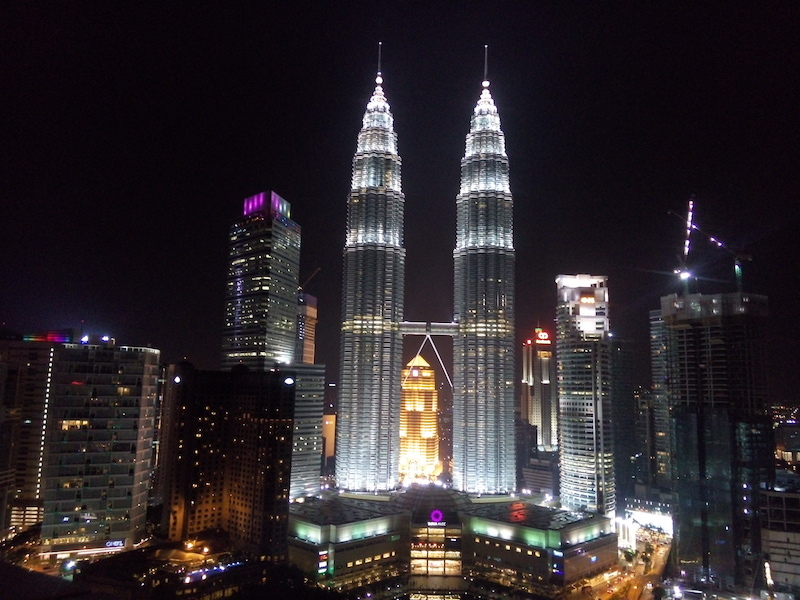 Driving into the city, the Petronas Twin Towers come into focus as the defining apparition that materializes on the skyline in the last 10-15 minutes of the journey to Kuala Lumpur’s golden triangle. The area that extends between Bukit Bintang, the Jalan Sultan Ismail five-star hotel strip, the Jalan P. Ram-lee party street and the entire Kuala Lumpur City Centre. The Federal Hotel had the delicate fragrance of sandalwood incense as we entered the lobby to check in. The hotel’s construction was completed just three days before the country’s Independence in 1957, making it and the Malaysian nation 61 years old. The hotel has hosted many foreign dignitaries and famous people such as Sir Robert Menzies, the former Prime Minister of Australia, and even “The Champ” Muhammad Ali. 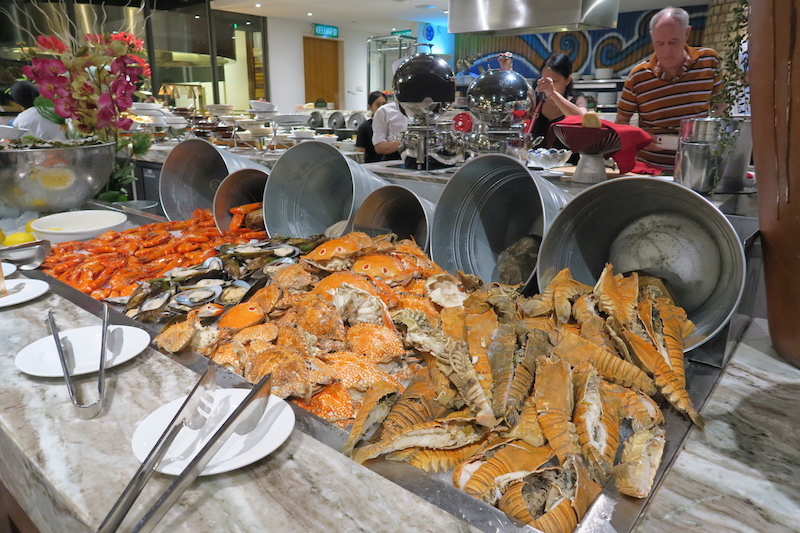 Dinner in The Federal’s Kontiki restaurant was a smorgasbord of seafood, carving stations, desserts and delights that was well worth the RM78 per person. After dinner, sipping cocktails and listening to the live music from the piano player and singer duo performing in the verandah lounge was a pleasant way to finish the evening on our first night. Hiring a minivan for the afternoon, our first stop was the KL butterfly park, which houses an estimated 5,000 butterflies, a museum and gift shop. 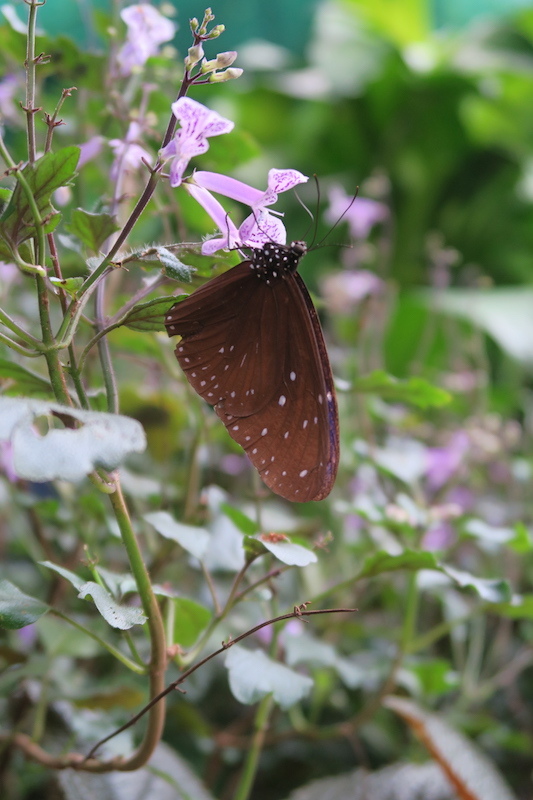 Inside the enclosure is a tropical garden wonderland where sparks of vibrant colorful winged specimens dance among flowers, foliage and fountains. 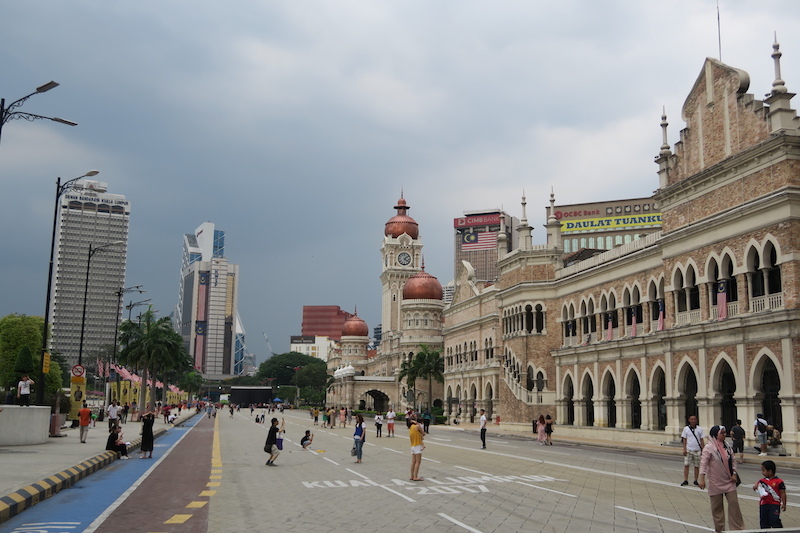 The next stop was the Sultan Abdul Samad Building. Formerly housing the British colonial administration, it is now home to both the Ministry of Communications and Multimedia and the Ministry of Tourism and Culture of Malaysia. Across the street is the Kuala Lumpur city gallery. Outside at its entrance is the “I [heart] KL” sign, which is a favorite place to pose for the perfect postcard picture. We then headed for the 421-meter tall Kuala Lumpur tower, the seventh tallest tower in the world. Unfortunately, a sudden tropical rainstorm, accompanied by thunder and lightning, caused the tower to be closed to the public. So we quickly jumped back into the minivan and headed for the undercover central markets. Established in 1888, the markets sell a variety of art, jewelry, handicrafts and knickknacks. 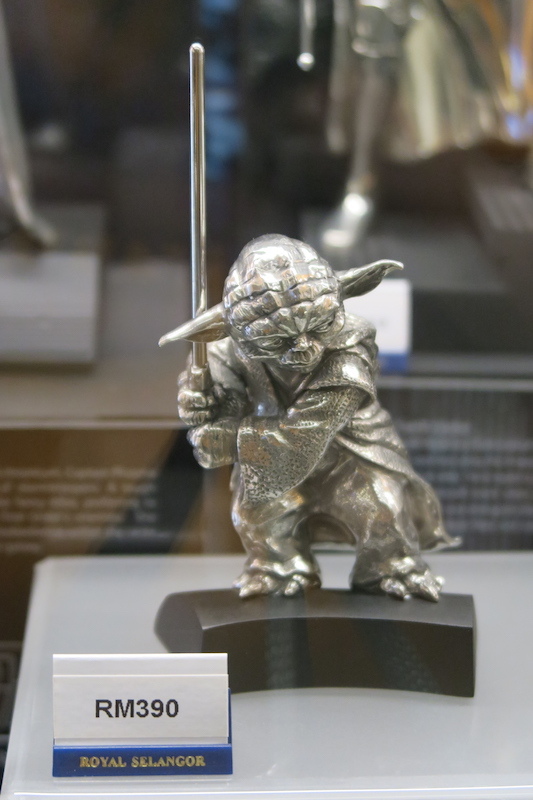 I was lucky enough to buy a limited edition Royal Selangor (Disney approved) Star Wars edition quality pewter Yoda figurine. The sun had set and we were dropped off at the Petronas Twin Towers, KL’s most famous attraction. When it was completed in 1999, the Twin Towers were the tallest buildings in the world. Although no longer holding that title, today the towers still remain as the tallest twin towered structure in the world. Suria Mall at the base of the towers has over 300 specialty stores and is one of the best shopping malls in Malaysia for luxury items. An interesting fact about the construction of the towers is that tower 1 was built by a Japanese consortium while tower 2 was built by a Korean one. The Koreans won the race and completed construction of tower 2 first. A great place to snap a high-quality shot of the towers while enjoying a drink is at the lounge bar located on the 32nd floor of the Traders hotel. 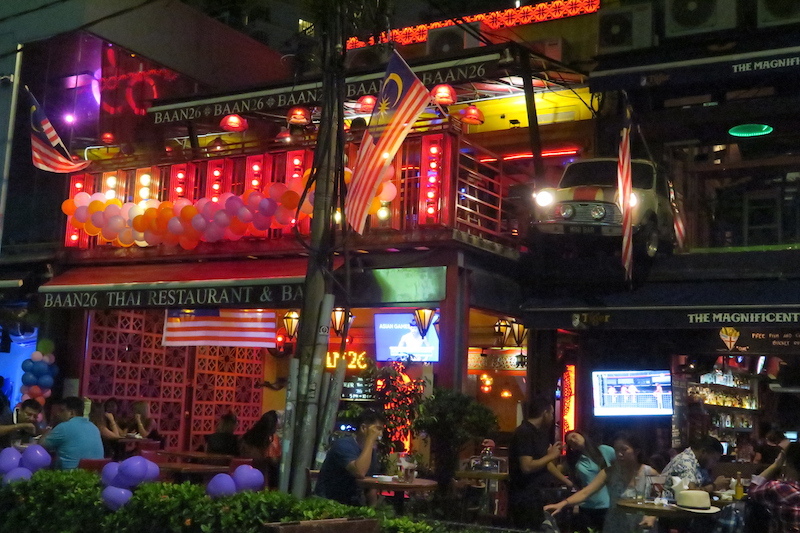 At Changkat Bukit Bintang you can drink late into the night in an entertaining part of the golden triangle. 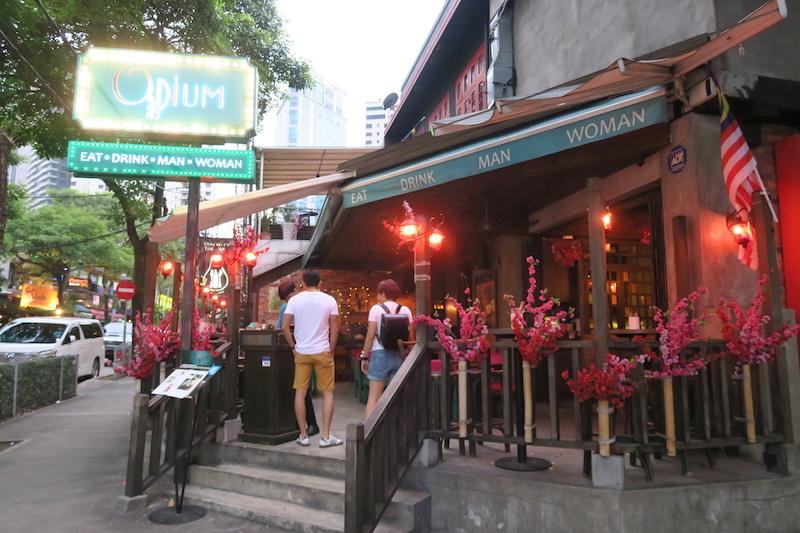 Here, upscale Chinese food can be found at the Opium bar or classic British pub food at the Magnificent Fish & Chips bar, where a Mini Cooper is almost driving out the building and exploding off the balcony. Before leaving HCMC I checked online what shows were playing in KL and discovered that the Moscow Circus was touring Malaysia. The Bolshoi and Nikulin Moscow circus companies have combined to put on an eight-month tour throughout cities and towns in Malaysia. Sunday night was their last performance in KL before heading to Penang. 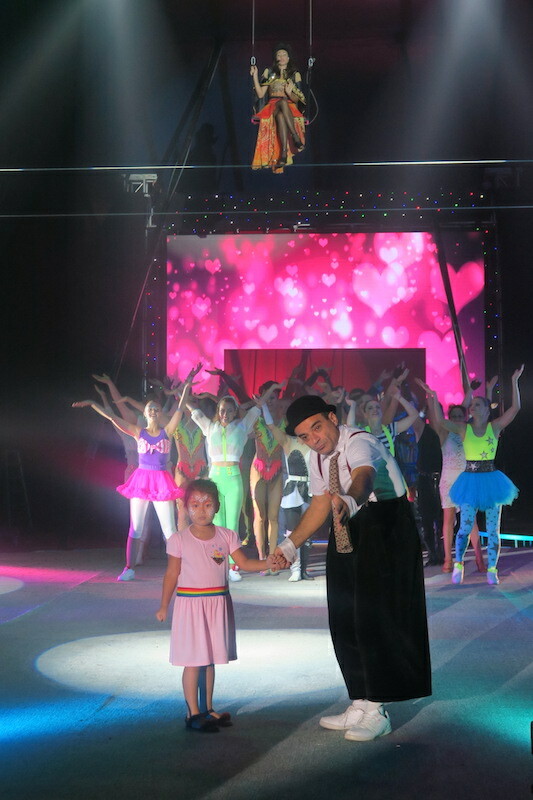 In recent years, the Moscow Circus has revolutionized itself and discontinued using live animals, and now has a human team of trapeze artists, acrobats and clowns. In KL, the big tent was set up on a field outside the Amcorp Mall, well-known for its weekly flea markets. An entertaining clown in baggy trousers held up by suspenders kicked off the show by using a duck whistle to whip the crowd into a frenzy. 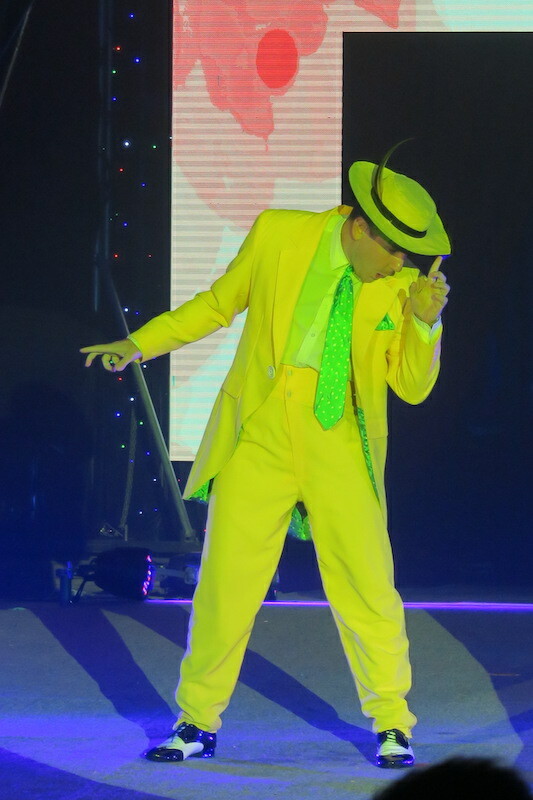 Then came the illusionist dance duo, Mykhaylo dressed in a yellow suit like Jim Carrey in the film The Mask, while Lyana did a dazzling outfit change every 30 seconds to the crowd’s amazement. Juggling three balls is a skill but juggling six or seven balls gets applauses and awe from the audience. The high wire act and flying trapeze acts were supported by skilled workmen behind the scenes who adjusted pulleys and cranks to keep the wires and cables taut and in place so that the performers could complete their many somersaults and death-defying antics. Come Monday and the circus was packing up the big tent and departing for Penang, while we headed to the airport to return to HCMC. 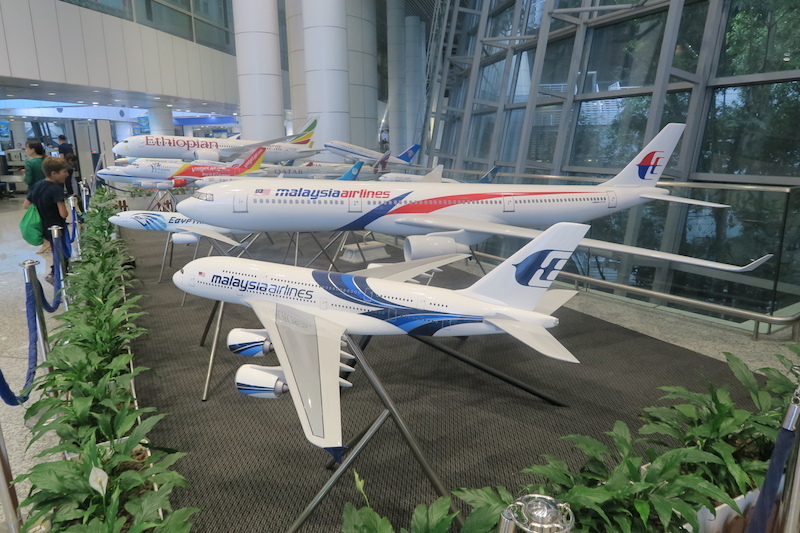 Inside the international terminal is a large display of large model airplanes of all the carriers that arrive and depart from KL. It’s a good place to take the final travel shot to complete the weekend album. Independence Day was the last national holiday in Vietnam for the year and so it’s back to work until New Years 2019. A great weekend of entertainment, fine hawker food, performances and great shopping had come to an end. The melting pot of cultures in KL lends to a diverse range of different threads that makes a city’s tapestry rich in heritage, culture and cuisine.